The Water Environment Federation’s new Operations Challenge laboratory event will determine alkalinity needs to facilitate nitrification. Operators will evaluate alkalinity and ammonia by analyzing a series of samples similar to those observed in water resource recovery facilities. This event will give operators an understanding of how alkalinity works in the wastewater treatment process to facilitate nitrification, as well as the analytical expertise to perform the tests onsite. This provides the real-time data needed to perform calculations, since these analyses typically are performed in a laboratory that can present a delay in the data. The alkalinity of water is a measure of its capacity to neutralize acids. It also refers to the buffering capacity, or the capacity to resist a change in pH. For wastewater operations, alkalinity is measured and reported in terms of equivalent calcium carbonate (CaCO3). Alkalinity is commonly measured to a certain pH. For wastewater, the measurement is total alkalinity, which is measured to a pH of 4.5 SU. Even though pH and alkalinity are related, there are distinct differences between these two parameters and how they can affect your facility operations. Alkalinity is often used as an indicator of biological activity. In wastewater operations, there are three forms of oxygen available to bacteria: dissolved oxygen (O2), nitrate ions (NO3– ), and sulfate ions (SO42-). Aerobic metabolisms use dissolved oxygen to convert food to energy. Certain classes of aerobic bacteria, called nitrifiers, use ammonia (NH3) for food instead of carbon-based organic compounds. This type of aerobic metabolism, which uses dissolved oxygen to convert ammonia to nitrate, is referred to as “nitrification.” Nitrifiers are the dominant bacteria when organic food supplies have been consumed. Further processes include denitrification, or anoxic metabolism, which occurs when bacteria utilize nitrate as the source of oxygen and the bacteria use nitrate as the oxygen source. In an anoxic environment, the nitrate ion is converted to nitrogen gas while the bacteria converts the food to energy. Finally, anaerobic conditions will occur when dissolved oxygen and nitrate are no longer present and the bacteria will obtain oxygen from sulfate. The sulfate is converted to hydrogen sulfide and other sulfur-related compounds. during nitrification. During nitrification, 7.14 mg of alkalinity as CaCO3 is destroyed for every milligram of ammonium ions oxidized. 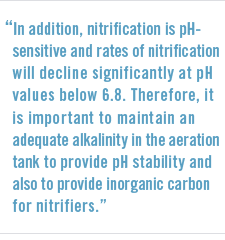 Lack of carbonate alkalinity will stop nitrification. In addition, nitrification is pH-sensitive and rates of nitrification will decline significantly at pH values below 6.8. Therefore, it is important to maintain an adequate alkalinity in the aeration tank to provide pH stability and also to provide inorganic carbon for nitrifiers. At pH values near 5.8 to 6.0, the rates may be 10% to 20% of the rate at pH 7.0. A pH of 7.0 to 7.2 is normally used to maintain reasonable nitrification rates, and for locations with low-alkalinity waters, alkalinity is added at the water resource recovery facility to maintain acceptable pH values. The amount of alkalinity added depends on the initial alkalinity concentration and amount of NH4-N to be oxidized. After complete nitrification, a residual alkalinity of 70 to 80 mg/L as CaCO3 in the aeration tank is desirable. If this alkalinity is not present, then alkalinity should be added to the aeration tank. Why is alkalinity or buffering important? chemical addition of aluminum or iron salts. pH in /a range that is favorable for biological activity. These optimum conditions include a near-neutral pH value between 7.0 and 7.4. Effective and efficient operation of a biological process depends on steady-state conditions. The best operations require conditions without sudden changes in any of the operating variables. If kept in a steady state, good flocculating types of microorganisms will be more numerous. 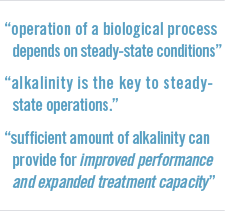 Alkalinity is the key to steady-state operations. The more stable the environment for the microorganisms, the more effectively they will be able to work. 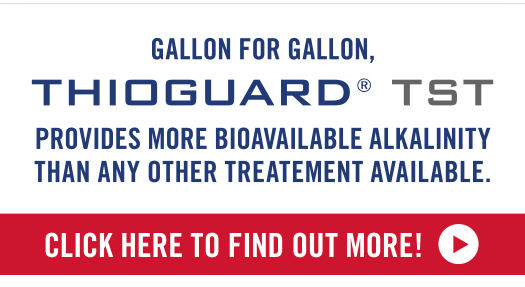 In other words, a sufficient amount of alkalinity can provide for improved performance and expanded treatment capacity. How much alkalinity is needed? effluent total alkalinity, in mg/L. For every mg/L of converted ammonia, alkalinity decreases by 7.14 mg/L. Therefore, to calculate theoretical ammonia removal, multiply the influent (raw) ammonia by 7.14 to determine the minimum amount of alkalinity needed for ammonia removal through nitrification. 257 mg/L is the minimum amount of alkalinity needed to nitrify 36 mg/L of influent ammonia. Once you have calculated the minimum amount of alkalinity needed to nitrify ammonia in wastewater, compare this value against your measured available influent alkalinity to determine if enough is present for complete ammonia removal, and how much (if any) additional alkalinity is needed to complete nitrification. In this example, alkalinity is insufficient to completely nitrify influent ammonia, and supplementation through denitrification or chemical addition is required. Remember that this is a minimum — you still need some for acid buffering in downstream processes, such as disinfection. (effluent residual) of 75 to 150 mg/L. As previously identified, total alkalinity is measured to a pH endpoint of 4.5. 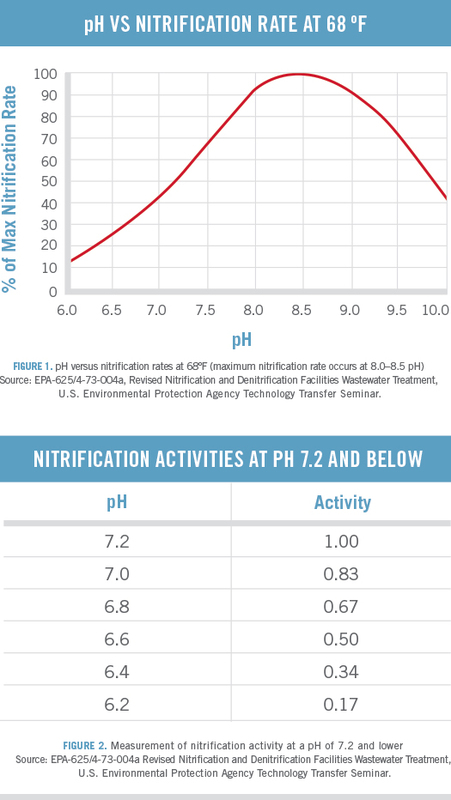 For typical wastewater treatment applications, operational pH never dips that low. When measuring total alkalinity, the endpoint reflects how much alkalinity would be available at a pH of 4.5. 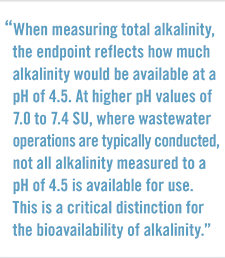 At higher pH values of 7.0 to 7.4 SU, where wastewater operations are typically conducted, not all alkalinity measured to a pH of 4.5 is available for use. This is a critical distinction for the bioavailability of alkalinity. Therefore, in addition to the alkalinity required for nitrification, additional alkalinity must be available to maintain the 7.0 to 7.4 pH. Typically, the amount of residual alkalinity required to maintain pH near neutral is between 70 and 80 mg/L as CaCO3. Alkalinity provides an optimal environment for microscopic organisms whose primary function is to reduce waste. In activated sludge, the desirable microorganisms are those that have the capability, under the right conditions, to clump and form a gelatinous floc that is heavy enough to settle. The formed floc or sludge can be then be characterized as having a sludge volume index. The optimum pH range is between 7.0 and 7.4. Although growth can occur at pH values of 6 to 9, it does so at much reduced rates (see Figures 1 and 2). It is also quite likely that undesirable forms of organisms will form at these ranges and cause bulking problems. The optimal pH for nitrification is 8.0, with nitrification limited below pH 6.0. Oxygen uptake is optimal at a 7.0 to 7.4 pH. Biochemical oxygen demand removal efficiency also decreases as pH moves outside this optimum range. Please Note: The information provided in this article is designed to be educational. It is not intended to provide any type of professional advice including without limitation legal, accounting, or engineering. Your use of the information provided here is voluntary and should be based on your own evaluation and analysis of its accuracy, appropriateness for your use, and any potential risks of using the information. The Water Environment Federation (WEF), author and the publisher of this article assume no liability of any kind with respect to the accuracy or completeness of the contents and specifically disclaim any implied warranties of merchantability or fitness of use for a particular purpose. Any references included are provided for informational purposes only and do not constitute endorsement of any sources.